KIEV, Ukraine -- The largest crowds gathering ahead of the Oct. 31 local elections are not in support of any political party, but rather they are protesting against the government’s proposed tax code. 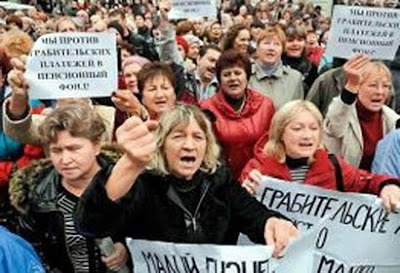 Private entrepreneurs take to the streets to protest against the increase in taxes and payments to the pension fund on Oct. 19 in Sevastopol, Crimea. The demonstrations, which are still gaining steam, come from politically non-aligned small- and medium-sized companies, whose representatives say the draft code could squeeze them out of business. What’s more, some of the biggest protests have broken out in regions which strongly supported President Viktor Yanukovych in this year’s presidential contest. About 5,000 citizens gathered in the southern shipyard city of Mykolayiv on Oct. 13 to protest the proposed tax code, which Yanukovych’s government hopes to adopt in November. Further protests have sprung up in other cities since then, including western Ukraine’s largest city Lviv and the eastern outpost of Lugansk. More than 1,000 gathered last week for a protest in Kyiv despite rain. Momentum is growing ahead of what is anticipated to be the biggest protest yet, to be held in Kyiv on Oct. 30, one day ahead of regional elections. More protests are scheduled by the loosely held group of small businesses and their advocates in November, and could build upon or merge with crowds organized by the political opposition, which fears the election could be rigged. “This tax code could force small businesses into the ghetto,” said Oleksandr Danylyuk, one of the protest organizers and head of the All-Ukrainian Center for Business Support. Warning that a wave of protests and civil unrest could break out as happened in France in recent weeks against government plans to raise the pension age, Danylyuk said citizens have little choice but to take to the streets. After a first botched attempt at tax reform early this summer which was strongly opposed by foreign investors for making businesses powerless against tax authorities, Prime Minister Mykola Azarov’s government produced a second draft tax reform plan this summer. Azarov has dubbed the proposed tax system as “the best in Europe,” while other top officials call it among the most “liberal” in the region. But the protests point to growing and nationwide voter anger at a tax reform plan that experts say threatens to cut taxes sharply for big business, while increasing the burden on smaller firms and individual entrepreneurs. “But it hasn’t turned into a single, consolidated social protest yet,” he added. Danylyuk said consolidation and larger crowds will start on Oct. 30, and will be followed up by more protests in November. “Businesses did not choose Oct. 30 by chance as the date to commence radical action,” he added. Employing six million people, two million Ukrainians are small businessmen that operate on a single flax tax. A single private entrepreneur generally pays a set monthly fee of around Hr 200, in addition to social taxes in the order of Hr 210. The proposed tax code would push many of them out of this privileged haven, forcing them to pay higher profit and income taxes, buy cashier equipment, pay accountants and charge value added tax upon the sale of their goods or services. Kostyantyn Poddubny, 29, who earns about Hr 50,000 annually running an internet-based tire sale service, says such changes will put him out of business. “I lose all the advantages I used to have relative to big companies – lower prices, free delivery. … I just don’t understand why I have to be equated with a big company when, really, my shop is no different from a shack at a street market,” he added. Vitaly Khomutynnyk, a pro-presidential lawmaker who chairs the committee in parliament overseeing tax reform, said he feels the pain of small businesses. Separately, Khomutynnyk said sharp tax cuts envisions for big business may need to be adjusted upon request from Ukraine’s main lender, the International Monetary Fund. The IMF fears that the reduced tax rates could widen Ukraine’s budget deficit.